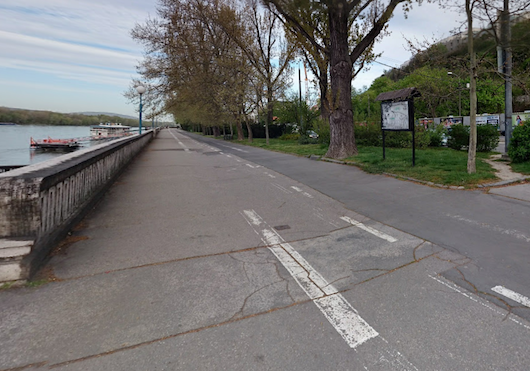 Running along the paths of the Danube is a classic European city river run. The full 10k loop, which runs ~5 km on both banks of the river between the Apollo and Lafranconi bridges, offers really nice variety. On the north (‘left bank’) side, location of Bratislava’s historic center, the promenade is a bit more developed, and right along the water for most of the way. On the south side (‘right bank’) in Petržalka, the path alternates between wooded and waterside sections. The north side of the path starts at the Apollo Bridge, and runs east, skirting Bratislava’s historic center. Heading west, you’ll have nice views of Bratislava’s historical center on your right and the river on your left. Just west of the SNP bridge is the famous Castle. Cross over the busy Lafranconi Bridge to the Petržalka section of the city and head east, where the road/path runs through the Pečniansky forest. East of the SNP Bridge (‘UFO Observation Deck”), the path is along the water, though not as developed as the north side. As an option or add-on, enjoy the paths and lawns of the Sad Janka Kráľa, also known as Janko Kráľ Orchard — the oldest public park in central Europe. Cross back over to the north side along the Old Bridge (Starý Most), or on the busier Apollo Bridge. Add-Ons: Tack on some extra miles in the Pečniansky forest west of the Lafranconi Bridge, in Janka Kráľa park (~2 km for a loop around its paths), or on the streets of the historic center.